Despite the rain it was still very humid and warm - and pretty unbearable wearing a raincoat! 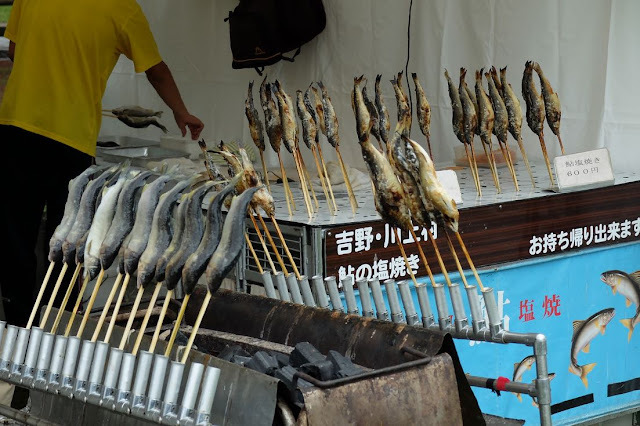 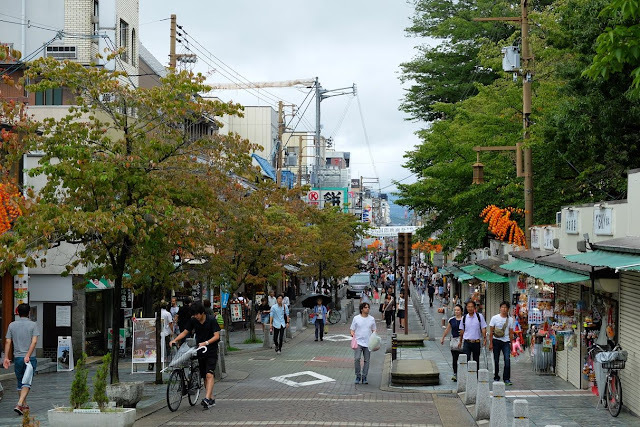 However by the time we'd reached the top of the street leading up to Nara Park, the weather had fined up enough to remove the coats and collapse the umbrellas. 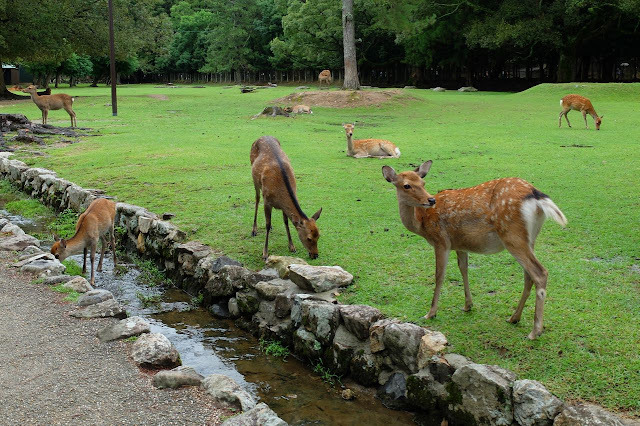 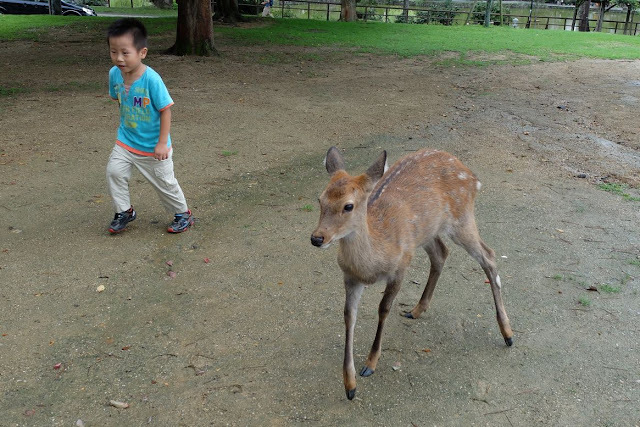 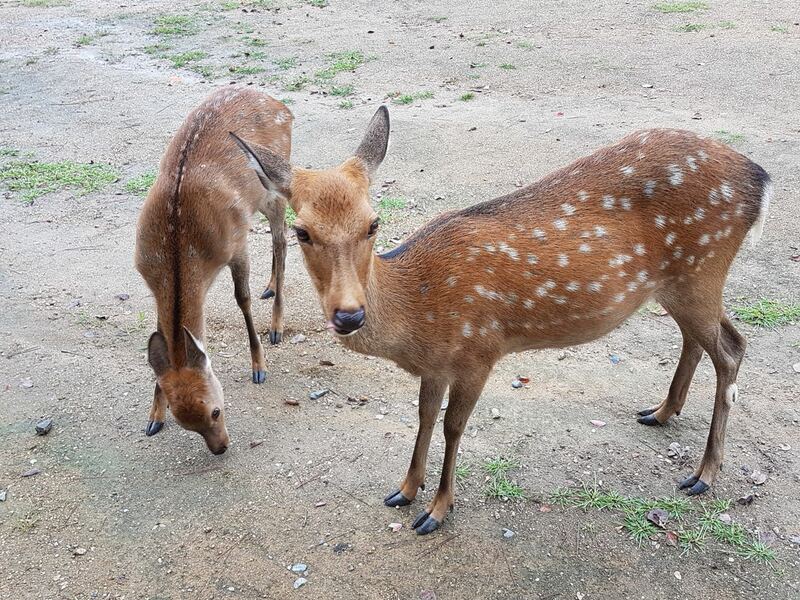 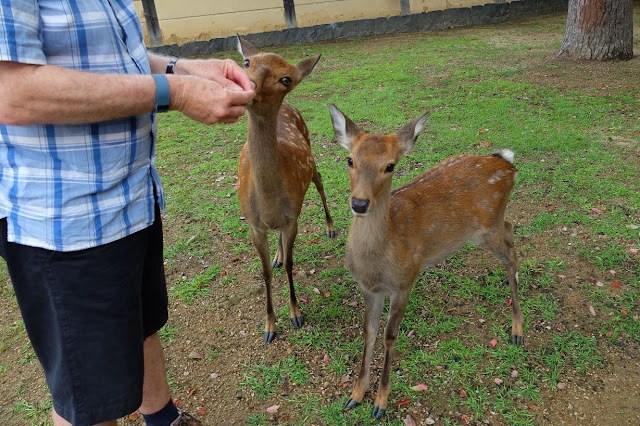 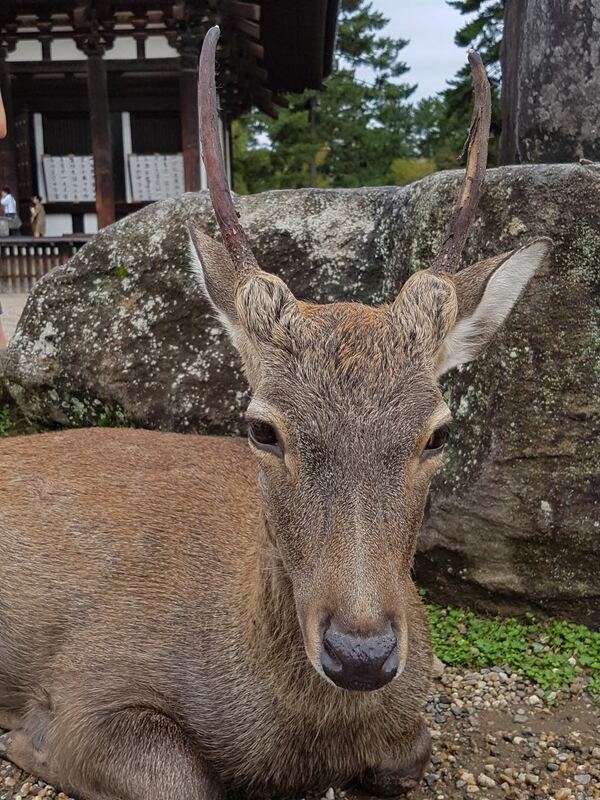 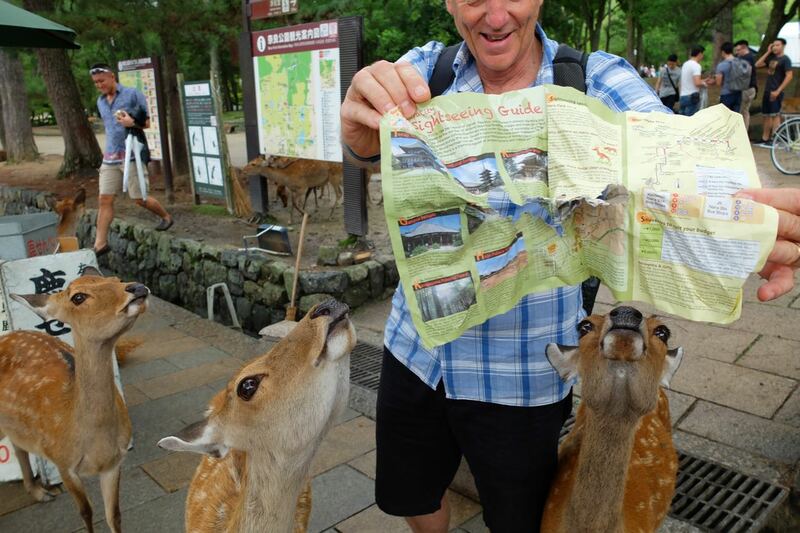 Nara is famous for its ancient temples, beautiful parklands AND its wild deer. As soon as we were out of the traffic area there were deer everywhere. 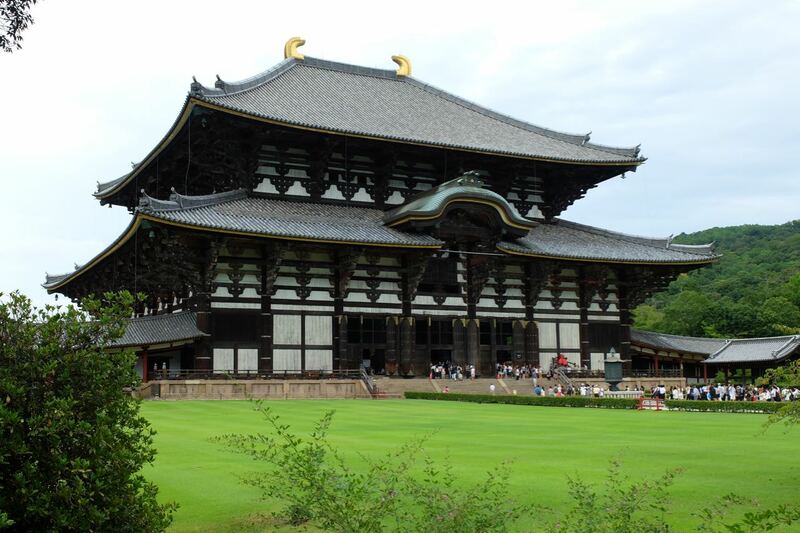 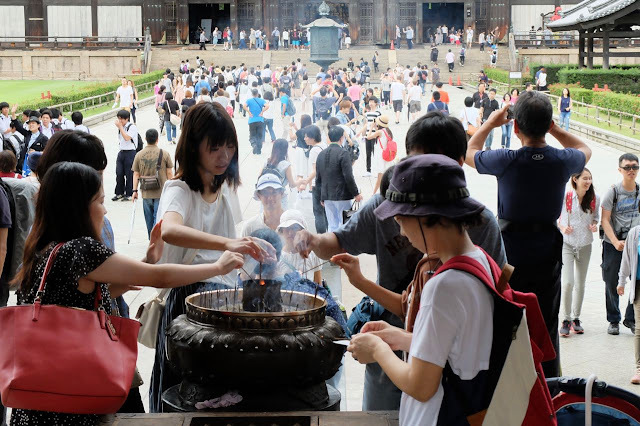 Nara's most beautiful temples are located in the extensive grounds of the Park. 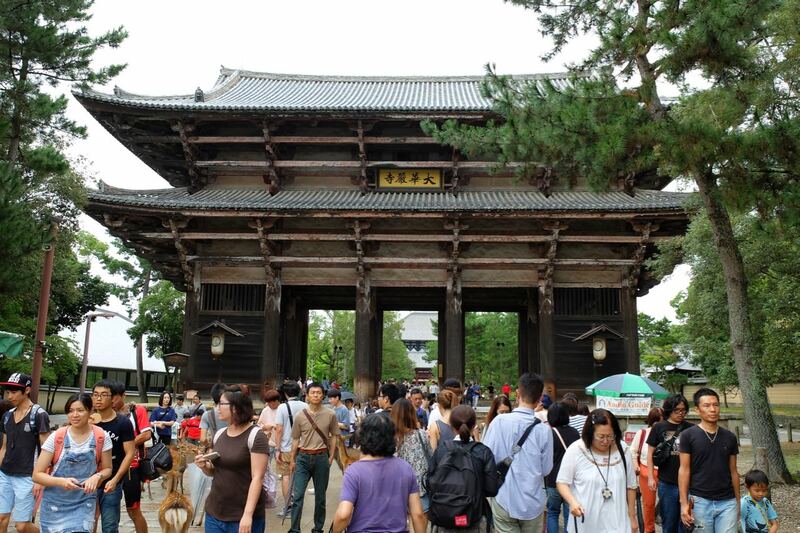 The Kofukuji Temple was established in Nara at the time Nara became the capital of Japan (710). 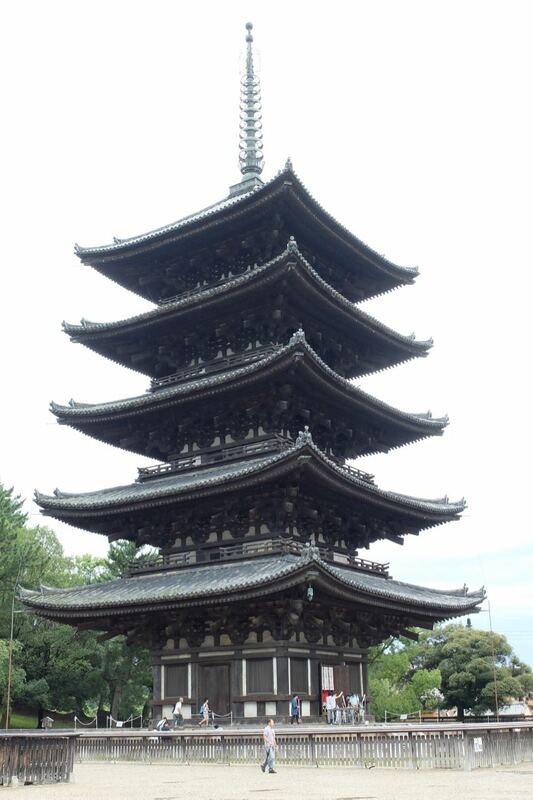 The 5 story pagoda for the temple is Japan's second tallest. The pagoda was most recently rebuilt in 1426. 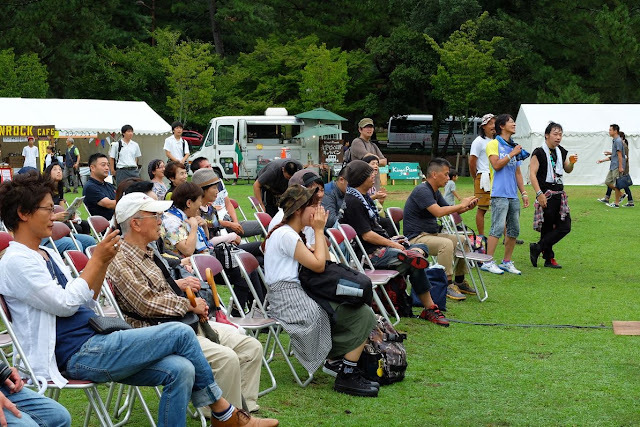 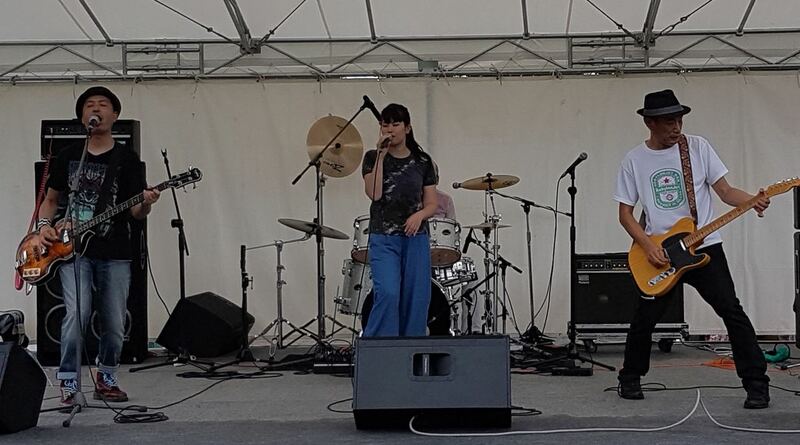 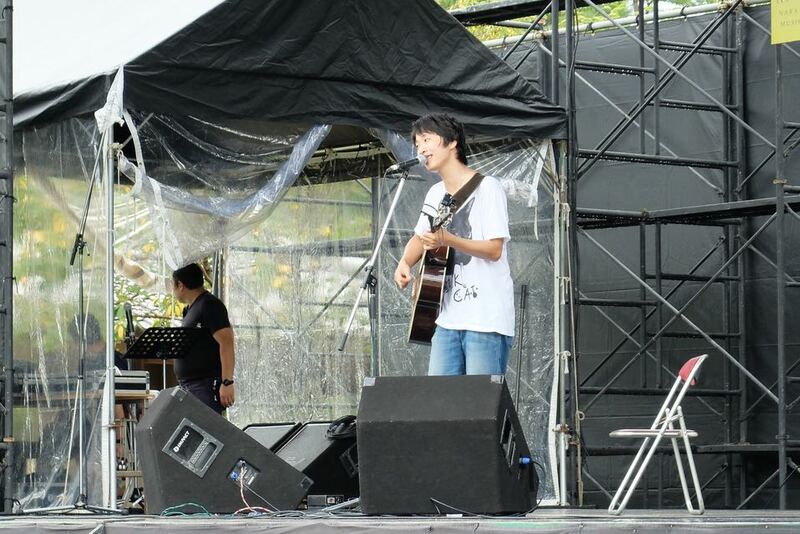 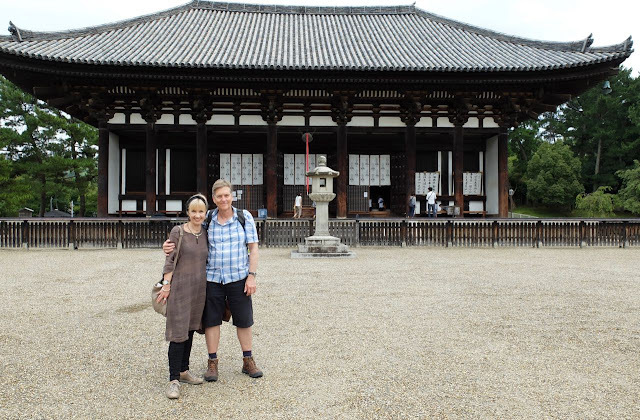 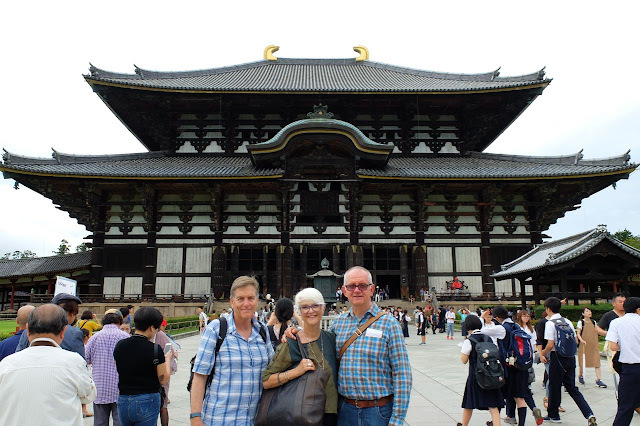 We were lucky to be in Nara during a contemporary Music Festival. 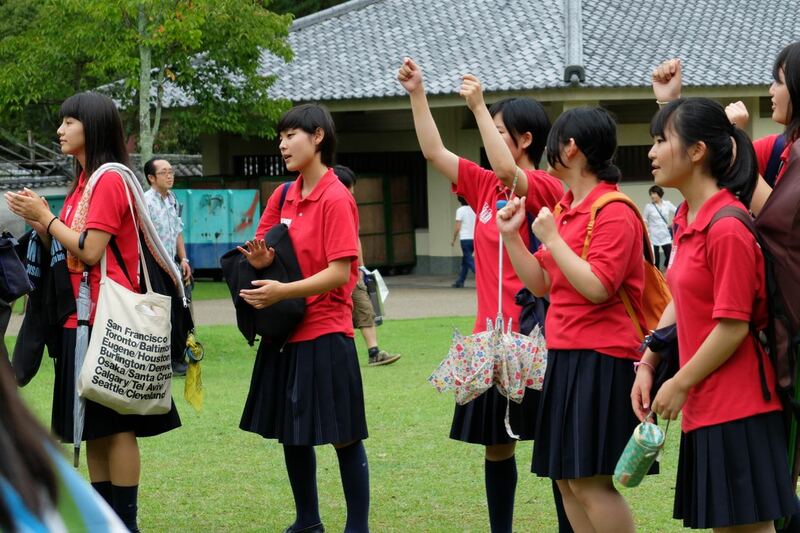 Everywhere we walked in the park today there was the sound of (mostly) young people singing and playing, making the atmosphere lively and fun. 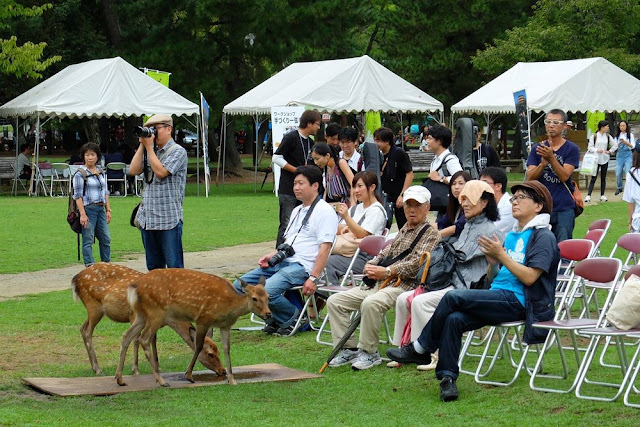 The deer enjoyed it too! This beautiful building was part of the Nara National Museum (also in Nara Park). Deer again. 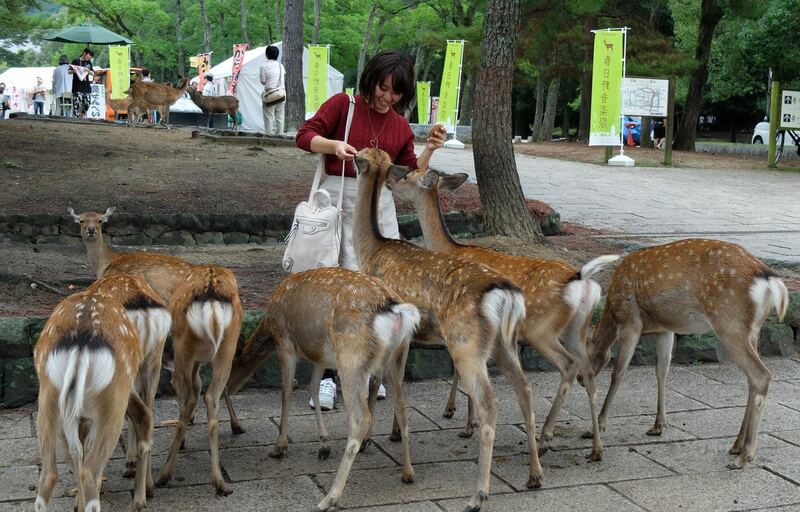 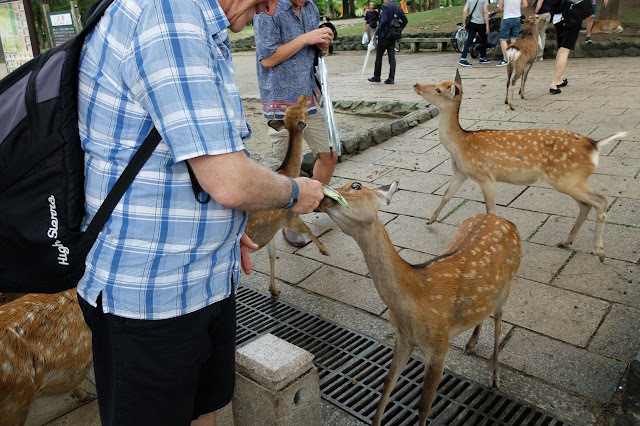 .... People buy packs of "cookies" to feed the deer - the areas around the cookie sellers are crowded with very excitable deer. ....but not before it had a big hole eaten out of the middle of it! 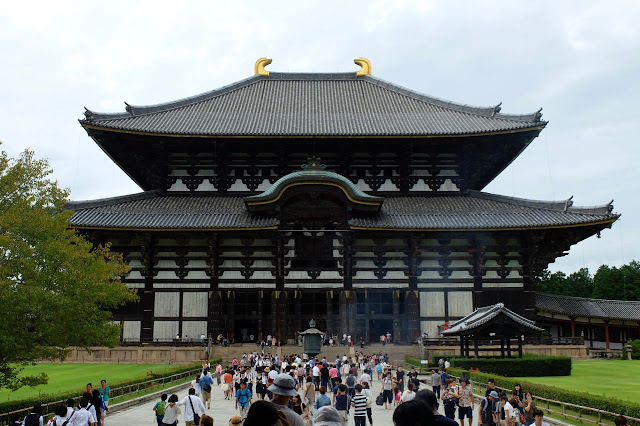 And then we came to the Nandaimon Gate of the Todaiji Temple (Great Eastern Temple) one of Japan's most famous and historically significant temples, and a real landmark in Nara. 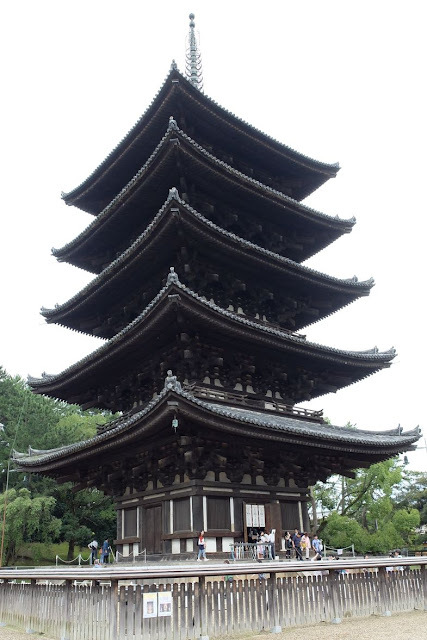 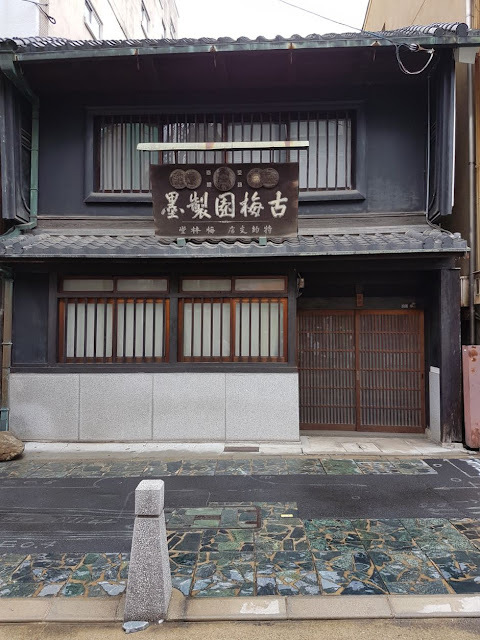 The temple was constructed in 752 as the head temple of all provincial Buddhist temples of Japan. 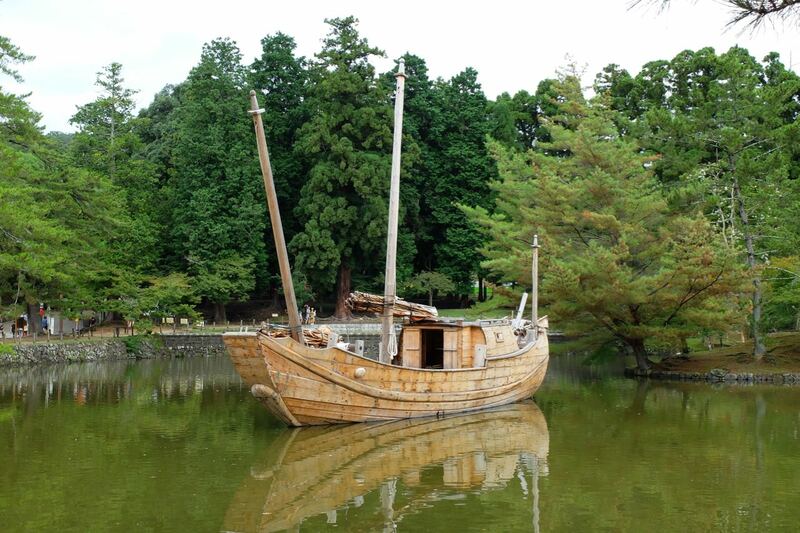 This wooden boat is an art installation created by Chinese artists this year at the temple. It poses the question: Can we once again sail through troubled waters on the same boat? 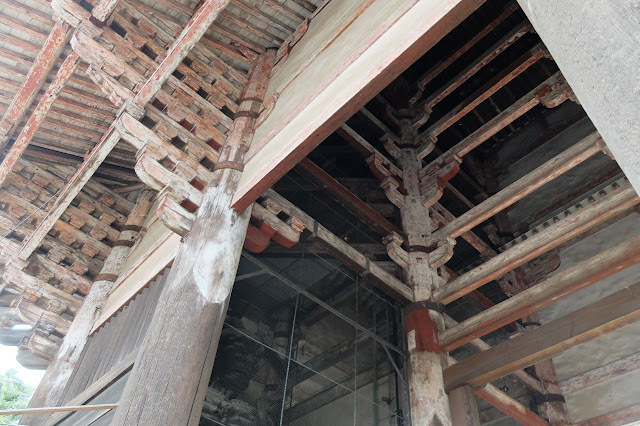 Todaji's Big Buddha Hall is the world's largest wooden building despite the fact that the present reconstruction of 1692 is only two thirds of the original temple's hall size. 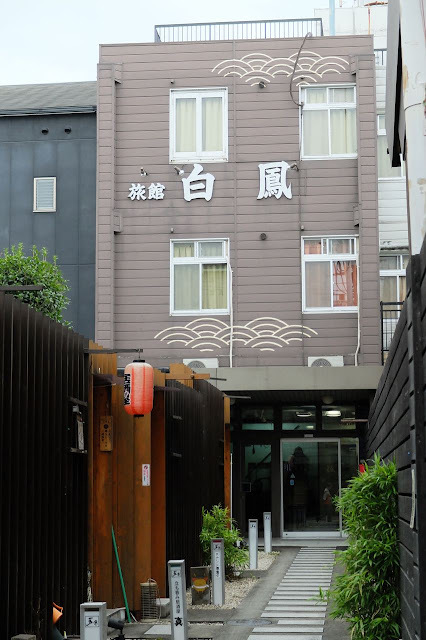 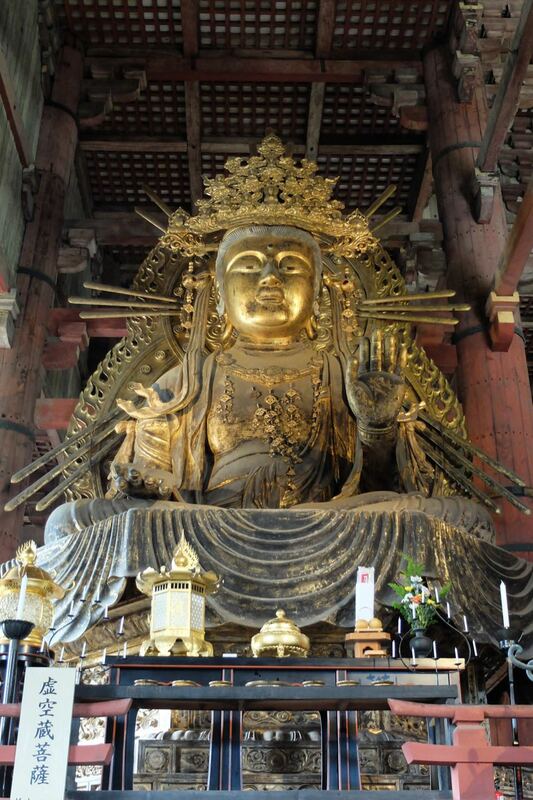 The massive building houses one of Japan's largest bronze statues of Buddha (15 metres tall). 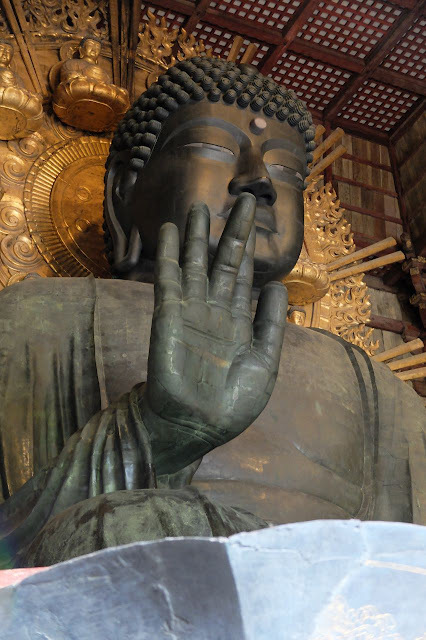 The Buddha's open hand is as tall as a human being. The big Buddha is flanked by two smaller Bodhisattvas. 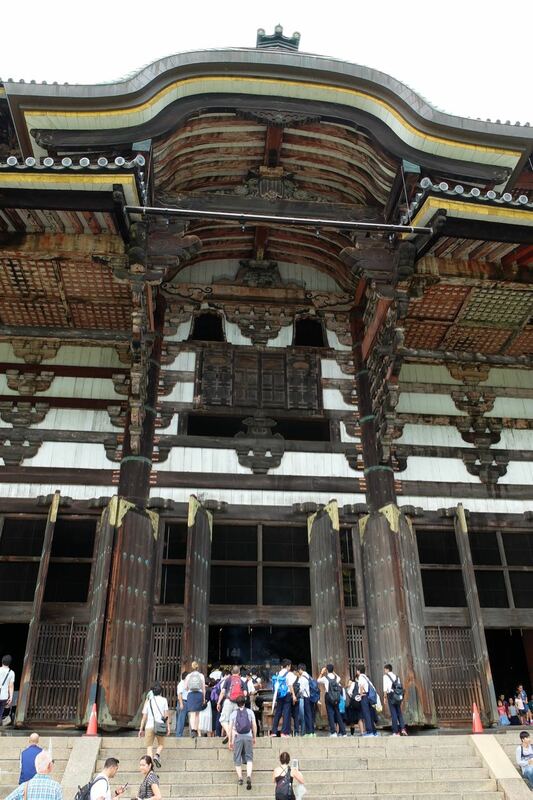 We were all very impressed with this stupendous building - it had a real presence! 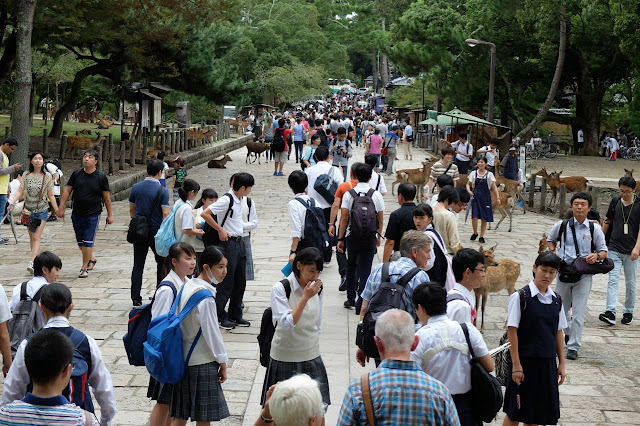 Nara was crowded today with lots of school groups (and local tourists). 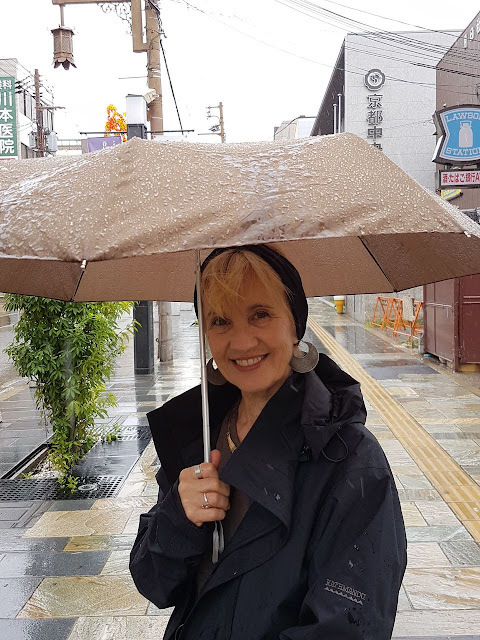 It poured with rain for the last half of our train trip back to Kyoto. 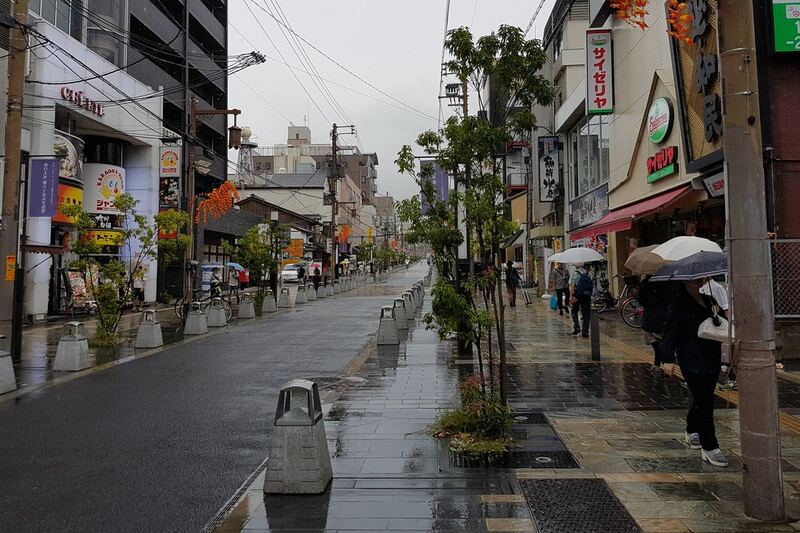 We thought we'd get drenched on our walk back to the hotel. 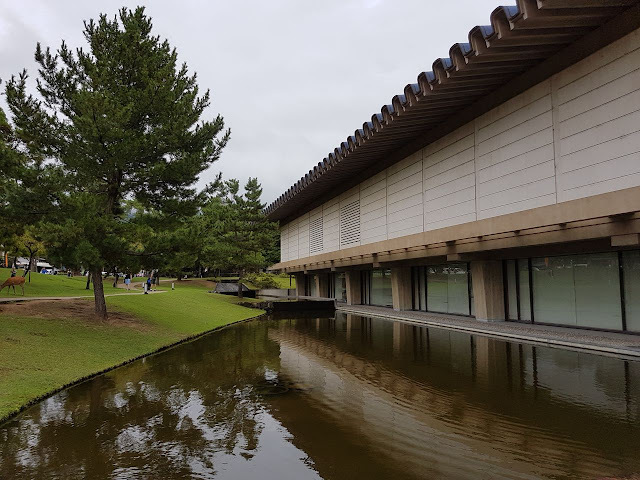 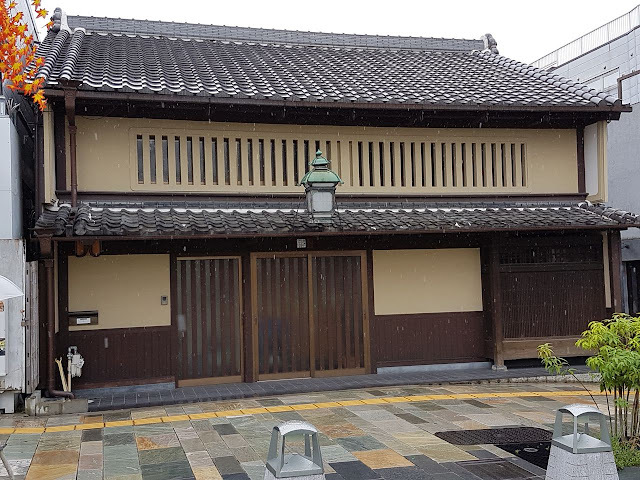 However the rain cleared for about 20 minutes allowing us to stay dry while we found the hotel bar for our daily "free drink"- just one of the many features of the Sakura Terrace - The Gallery that we have grown to love over the past few days!